attwood Corporation Economy Pedestal Adj 11.5"-17.5"
7" x 7" lock'n-pin 3/4" pin base sp-67739-t is aluminum. It features an Acetal Bushing for secure fit and durability. 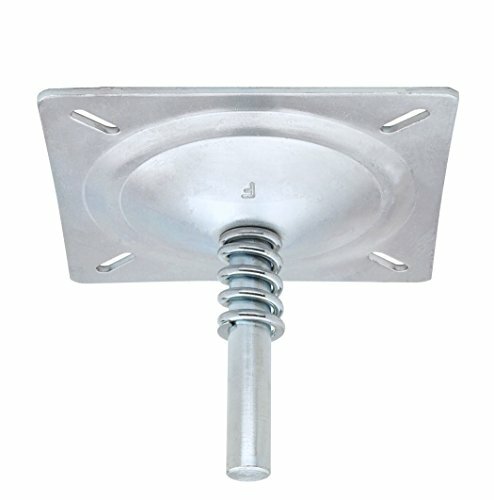 Easy to install with six screws or bolts through the deck. 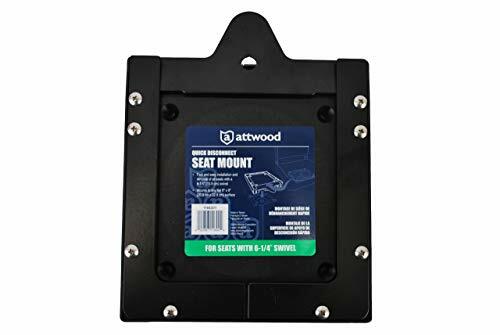 Add more seating to your pontoon, fishing or cruising boat with Attwood seating products. Attwood develops high value, engineered marine products to make life on the water easier to enjoy. Made to meet the demands of boat builders and distribution partners, our products are extensively tested on-site in our lab to provide worry-free boating under all conditions. 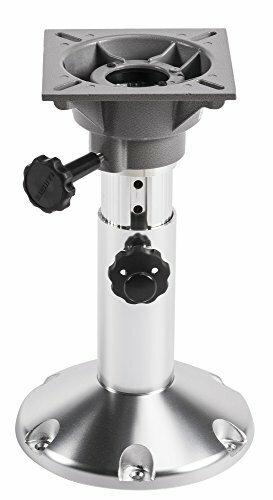 12-18" Adjustable Pedestal w/Swivel Solid contruction for use on the water. Polished anodized aluminum 2 7/8" tube with locking 360 degree swivel. 2 year warranty. 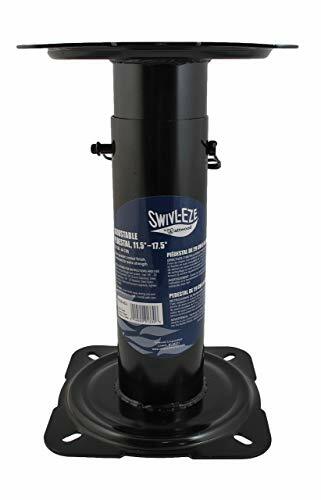 Wise #3059 pontoon cup holder features dual stainless steel cups, specially designed weighted vinyl hold down flaptucks in to secure cupholder to seat. Brushed aluminum 11" seat extension post. 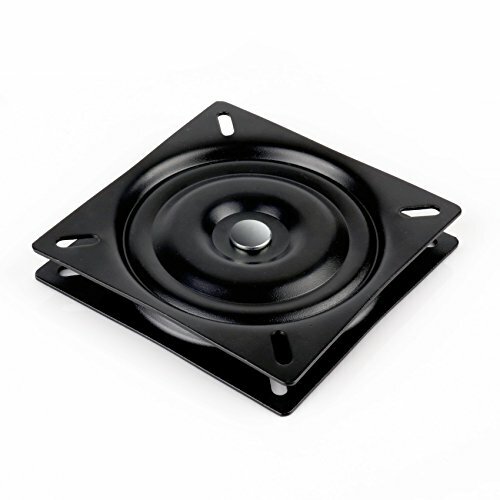 Uses 3/4" Pin-type mounting and tight fit nylon bushing for stability. Non-threaded pin. 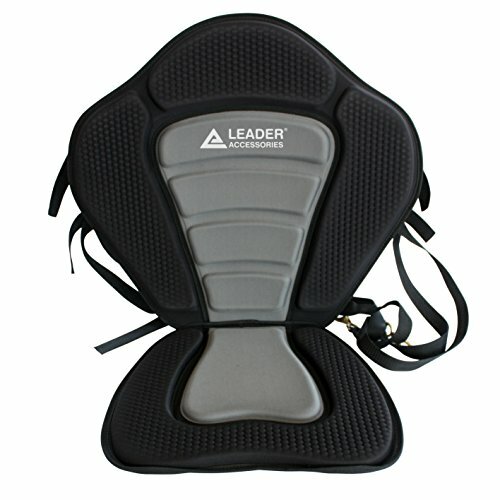 Fits Most Standard 7 in (17.6 cm) x 7 in (17.6 cm) Seat Mounts. 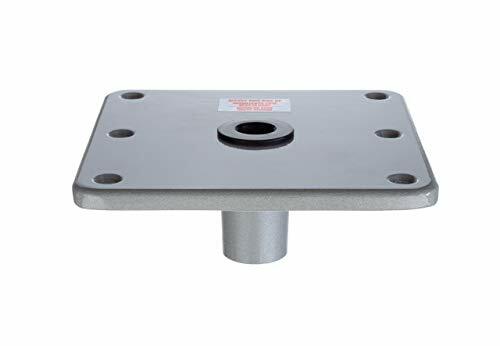 Wise Seat Slide with Seat Mount for marine seat pedestal application; Available in 2-3/8" and 2-7/8" pedestal post size. Slide portion is constructed with extruded aluminum and allows 5" of fore and aft travel. Easy to use adjustment handle. Seat mount constructed of cast aluminum with injection molded plastic handles. Allows seat to lock down or swivel with turn of adjustment knob. Locking paddle handle features protruding lock mechanism to lock into post with pre-tapped adjustment holes. BIA Standard multiple hole pattern fits virtually all seat brands. 3 Year Warranty. Black power coated steel ball bearing swivel. 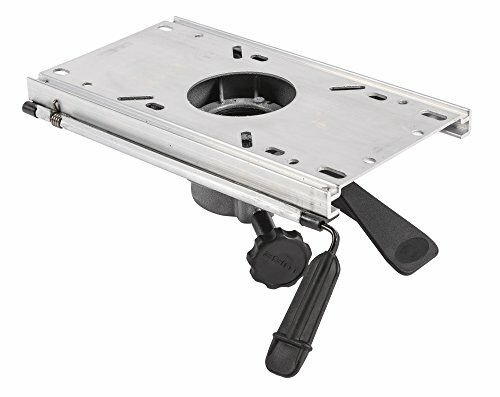 Swivels 360 degree.Hole pattern fits most seats.size: 6"x 6"
Rotates 360 Degrees, Adjusts From 22.5 in. to 29.8 in. Adjustable from 22.5 in. to 29.8 in. 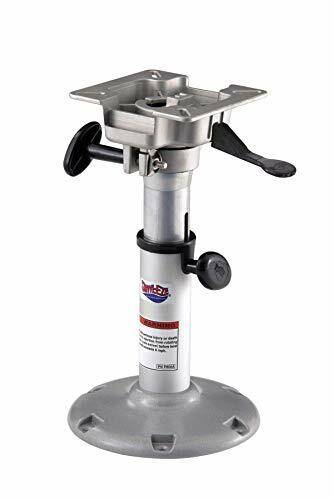 Our Stainless steel seat base is made of durable stainless steel hardware for fishing and leisure boats. The base plates are welded with reinforcing washers for strength and durability. 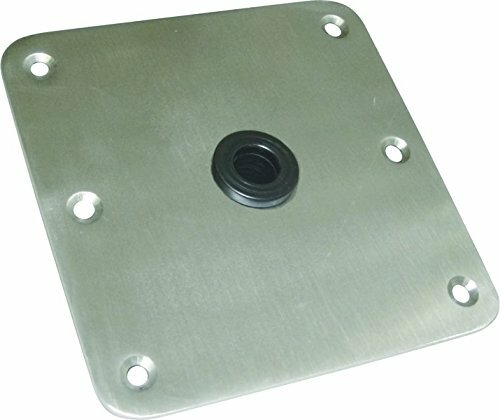 Comes standard with 6 countersunk mounting holes. welded with reinforcing washers for strength and durability. 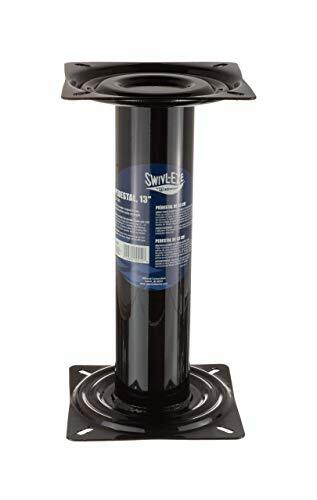 Springfield Marine 1300902 Plug-in Power-Rise Air Ride Pedestal - 22-1/4" - 28-3/4"
Springfield Marine 1300902 Plug-In Power-Rise Air Ride Pedestal. Pedestal dimensions are 22-1/4" - 28-3/4", and can be locked in position to prevent rotation. Provides a safe and stable place to sit. NOTE: The product is there for 6.25 inch and 7 inch. 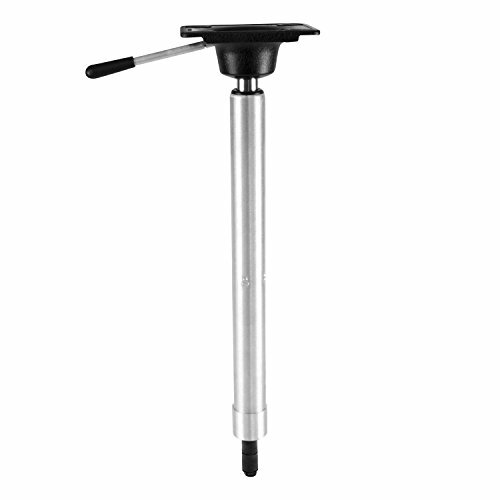 Brand: Swivl-Eze | Manufacturer: Attwood, Inc.